Nope, no word on that. Only monthly passes at this time. I looked at one of the old machines and was I correct that you had to add at least $20 to use a credit or debit card? That's ridiculous. The new Muni machines are annoying in a different way. You have to chose one of their pre-set options including $2, $5, $10, etc. Why does a system that costs $2 allow you to add $5 which leaves you with half a fare? Why can't you just add or subtract a dollar like BART machines? Any word on being able to pay for the monthly parking for your clipper card WITH your clipper card? I get commuter checks and can't figure how to use them to pay for the monthly parking. 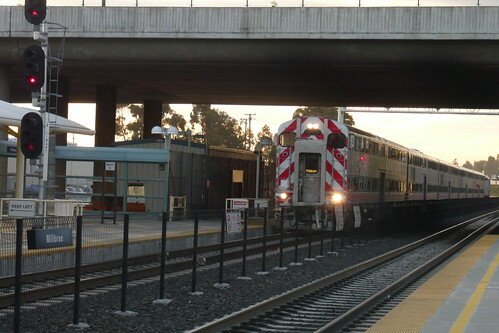 I think my only option is to go to the caltrain HQ in San Carlos? Unlike BART, it's not possible to use your Clipper card to pay for monthly parking. Your better bet is to see if you can get your transit/parking vouchers on a special debit card. Commuter Check has a green card for transit and a blue card for parking. By getting the card, you can pay for monthly parking at a TVM.